Angus and Hugh MacNaughton are brothers. They dislike each other … A lot.They have loathed each other since Hugh bit Angus at a family picnic many years ago. In a last-ditch attempt to forge a brotherly bond between the two, Mr and Mrs MacNaughton secure them jobs at an exclusive five-star game lodge. They manage to convince (bribe in the case of Angus) the siblings to work at Sasekile Private Game Lodge for a year.A Year in the Wild tells the uproarious, cringe-worthy and hilarious tales of Angus and Hugh in the form of weekly emails to their sister Julia. Their experiences include encounters with guests, animals, female staff and often a mixture of these.Combine: an eclectic mix of rich, over-demanding and adulterous guests, a dash of crazy bush lodge staff including two jealous brothers (one a bitterly sarcastic game ranger and the other an over-eager lodge manager) and throw in the beauty of the African bushveld. Shake well. Conflict and disaster are inevitable. At first I was undecided on a story told through emails alone. I should not have worried. This is one of the best audiobooks I’ve listened too in a long time. It is both written and narrated well, dragging you into the bush alongside the brothers as they attempt to survive a year in each others company. I laughed, cried and choked on my coffee at Angus’ often inappropriate sarcasm. I hope the sequel is narrated soon. Until then, I think A Year In The Wild is going to be replayed often! James Hendry grew up in Johannesburg and was schooled at St John’s College. He has an honors degree in science from the University of Natal, Pietermaritzburg and a Masters degree in Human Development from the University of Cape Town. After a year as a guitar teacher and sports coach, James moved to the wilderness, where for the next eight years, he worked as a safari guide, head ranger, guide trainer, land manager and lodge manager. Working in the bush afforded James the chance to further his research in rural South Africa. He has published various articles on his research with rural people who live around game reserves – this was the focus of his master’s thesis. James has always had a bent for the theatrical. He has worked as a professional musician, guitar teacher and part-time actor. 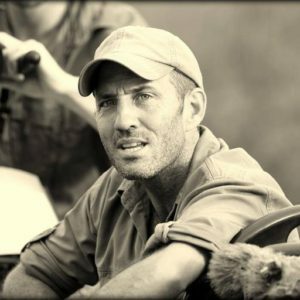 He has also dabbled in wildlife filmmaking (appearing in a children’s wildlife series), produces sales videos for safari operators and composes the music scores for these videos. James has a dry, sarcastic wit that reflects the inspiration and joy he derives from observing the human condition and the natural environment. He speaks both Shangane and isiZulu and is the author and co-author of three South African best-selling books. Published by: Audioshelf (Pty) Ltd.